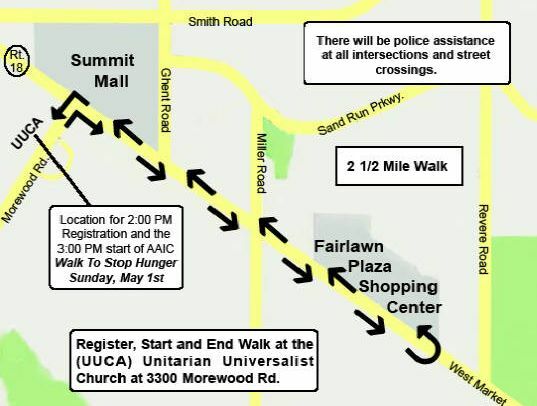 The Akron Area Interfaith Council will host its annual Walk to Stop Hunger on Sunday, May 1, 2011 at the Unitarian Universalist Church (directions here). Collect nonperishable food donations and turn them in on May 1 at the Walk. All proceeds from the Food Collections will go to the Akron-Canton Regional Foodbank. Individuals and groups are invited to help the hungry in Northeast Ohio. Registration is available online. The walk is a 2 1/2 mile walk and will begin and end at the Unitarian Universalist Church. Registration starts at 2:00 PM and the walk will begin at 3:00 PM. Refreshments will be served during registration and hot soup will be available after the walk. For more information, please visit www.aaichungerwalk.org, call 330.329.5132, or email info@aaichungerwalk.org.The walk route is below. It isn’t often that I have read a “how to” book that keeps my attention and stirs my imagination. Author Ruthie Jacobsen has managed to do both splendidly in a short and provocative paper back, Bridges 101. If I have peaked your interest in this book, and I hope I have, you can read it for yourself by checking it out of our Church Library (see librarian Doris Grayem) or by purchasing it from the ABC in Mount Vernon (800-765-6955).